Medical Training Pasco County: What Does A Phlebotomy Technician Do? If you have been considering a healthcare career, but you are daunted by the extensive education and certifications required of most positions, then it may be time to consider working as a phlebotomy technician. This position is essential to patient care, and with a phlebotomy training course from Pasco Medical Training, you could be on the fast track to a rewarding career! 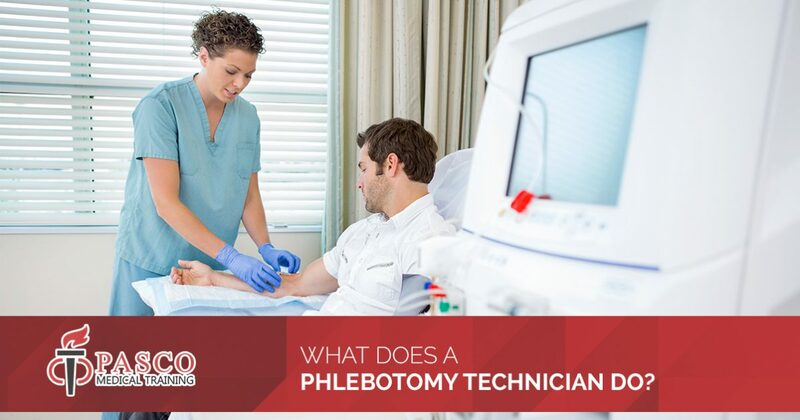 Read on to learn more about this lesser known career path, and enroll in a Pasco phlebotomy test preparation course today! Phlebotomy is the process of drawing blood or other fluids from a patient’s veins. It can also encompass the process of introducing fluids into a patient’s body, such as during a transfusion. It may seem like a narrow course of study if you once dreamed of becoming a doctor, but phlebotomy is essential in the course of treating a patient. Blood tests performed by a phlebotomy technician can detect disease, bacterial infections, and other health concerns, like cholesterol levels. The wide application of phlebotomy is why there are jobs available in all kinds of health centers across the country. As the definition of phlebotomy may suggest, a phlebotomist’s main role is collecting blood samples to be tested. Occasionally, a phlebotomist technician may also be asked to collect other bodily fluids and samples like urine or tissue. The first step in this process is gathering all the proper equipment and instruments, such as needles, a tourniquet, collection tubes, and so on, and having everything ready for the procedure before meeting the patient. There are also important health and procedures every technician needs to follow, and sanitizing each and every tool during the process can help the patient feel more comfortable. While the purpose of a phlebotomist technician’s visit is to collect blood samples, a large portion of their job is interacting with the patient undergoing the blood draw. Communication and interpersonal skills are therefore an important aspect of any technician. They need to prepare the patient for the procedure and explain the process. 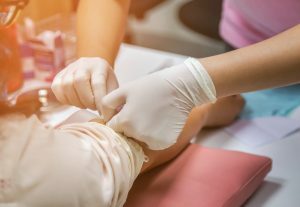 Many people feel uncomfortable around needles, and if they have poor experiences with blood draws in the past, there may be added fear and anticipated pain to address. The phlebotomist technician needs to anticipate a patient’s response and offer distraction techniques if necessary to help them feel as comfortable as possible. If the patient does have an adverse reaction to the procedure, the technician needs to know how to best care for them as they recover. The least glamorous aspect of a phlebotomist technician’s job – but undoubtedly the most important – is the administrative work surrounding whatever samples they take. They need to inventory instruments and supplies, for example, so every technician has what they need to perform a procedure. They should also verify the patient’s identity before every procedure, and properly dispose of one-use equipment like needles afterwards. A phlebotomist technician is also responsible for correctly labeling and tracking whatever samples they take. This aspect of the job requires attention to detail, as each vial’s label dictates where the sample goes and what kind of testing the contents will undergo. The results can be key to determining a patient’s course of treatment, which is what makes administrative work such an essential part of the job. If you want to help people, and you don’t shy away from needles or blood, then becoming a phlebotomist technician may be your calling. Phlebotomy is incredibly important to a patient’s overall care, and becoming a technician can benefit you as well. There are almost endless possibilities for long-term careers, and once you receive your phlebotomy certification, you can find a job that matches the hours and location you have in mind. As an added bonus, even entry-level positions in this industry pay very well. Are you excited about a new career in healthcare? Start your journey today with Pasco Medical Training. We offer phlebotomy test prep courses during the day, evenings, or even on the weekend, and our curriculum and licensed educators will help you gain the skills and knowledge you need to take the certified phlebotomy technician national exam. We offer hands-on training at affordable prices, so you can experience the education you deserve. Enroll today to get started!